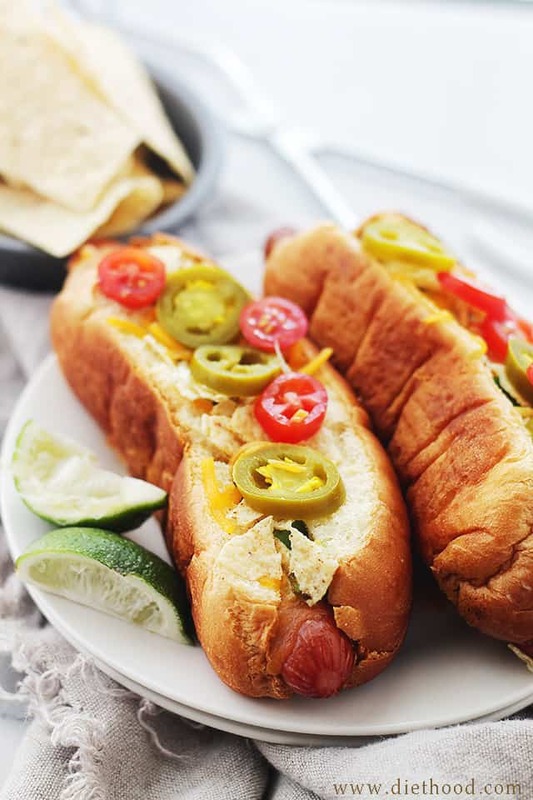 Nacho Hot Dogs: Cheesy and crunchy Nacho Hot Dogs packed with tortilla chips, jalapenos, avocado, tomatoes, and sour cream! Ketchup and Mustard, please move over. This bag-thingamajig costs a bit less than a mortgage. That’s not normal, I know. BUT I keep bags for years and years. Trust me, this thing will be on my shoulder for the next decade. Fingers crossed, a Snickers Bar won’ get lost in there and smudge itself all over the bottom of the lining… That is how the life of my previous ridiculously-overpriced-bag ended. In fact, I don’t even know the whole joke – I only remember the punch line. I heard it when I was in middle school and I still talk about it. Obvi. By the wayz, this recipe was inspired by today’s giveaway! You guys, there’s a GRILL up for grabs! YAY! Or you can just take the $300 smackaroos and run with ’em. Spend them on a pair of SJP shoes. Or a Michael Kors Bag!! You know I would! Also?? Hot Dogs are my guilty pleasure. Honestly. I eat about 2 or 3 hot dogs in a year, but I make sure to load ’em up, phat-girl-style. 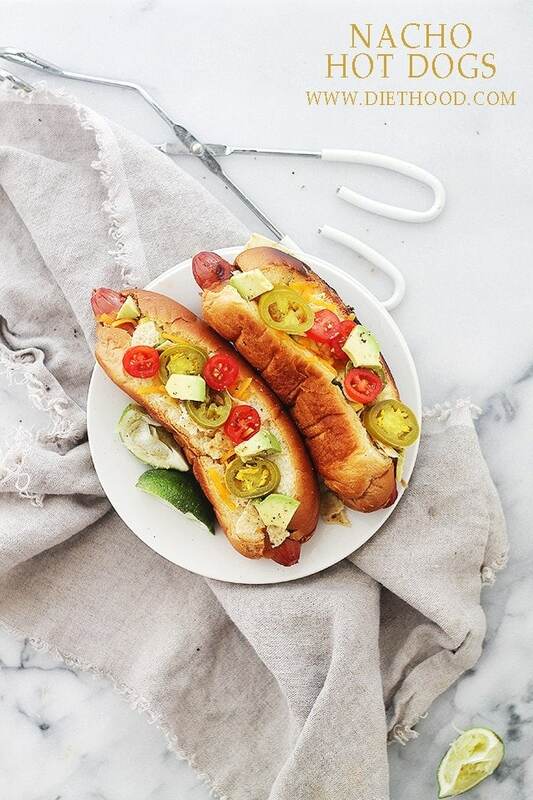 Sorta like these Bacon-Wrapped Tex-Mex Hot Dogs. Or today’s, Nacho Hot Dogs. I stopped at one, but believe you me, I could’ve had all 8. They are cheesy and crunchy, packed with tortilla chips, jalapenos, avocado, tomatoes, sour cream!!! Good heavens, they are incredible!! 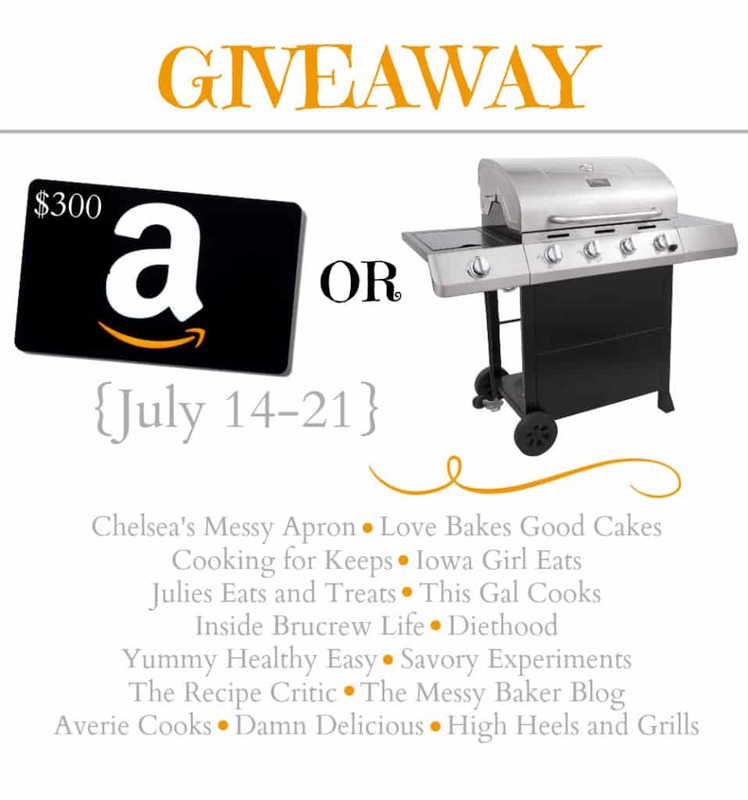 Enter the giveaway, print the recipe, and EAT! I am not going to list the amount of ingredients needed because you should just load these up with as much nacho-goodies as you want to! 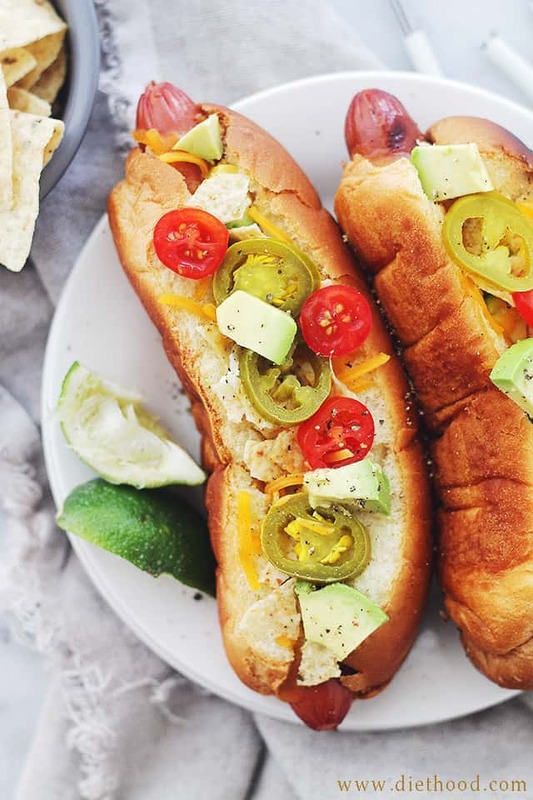 Cheesy and crunchy Nacho Hot Dogs packed with tortilla chips, jalapenos, avocado, tomatoes, and sour cream! Build your hot dogs by spreading sour cream on each of the buns. Sprinkle with shredded cheddar cheese; melt it. Top with crumbled tortilla chips, sliced jalapenos, avocado chunks, and tomato slices. Squeeze lime juice over each prepared hot dog. Giveaway: Eligible to one (1) winner residing in one of the 48 contiguous states. Must be 18 years of age to enter giveaway. Starts 12 am 7/14/2014 (EST time) and ends 12 am 7/21/2014 (EST time). To enter the giveaway, you must participate in at minimum, one of the listed entries in the widget and an email address must be provided. Winner will be announced via email and must respond within 24 hours of deliverance. Failure to respond will forfeit your chance in winning and a new winner will be chosen. Please be advised items may appear different from the photo shown. The persons participating in this giveaway are not held responsible for missing/broken items received by the winner. Good luck and thank you for your entries. Talk about the ultimate snack for baseball season! love a good hot dog and this is made even BETTER with nachos! i think you may have stumbled onto something great here.. thanks for sharing! My pregnant heart might as very well exploded when I read this recipe! Yummy! 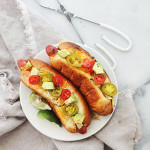 I love gourmet hot dogs that you can dress up and garnish with amazing toppings! Everything about this recipe screams delish, cannot wait to try it out. Nacho hot dogs may be the best hot dog invention ever! I don’t think I’ve ever come across a hot dog I didn’t like, and this one looks INSANELY delicious! For reals?!! GAH! I could eat 27 of these! Well it looks like someone is feeling better! 🙂 Nothing sounds better than these to me today. Love ’em! Okay, now I have that punch love stuck in my head. And I want to stuff my face with this!